A ribbon cutting was held for the newly constructed Bridge #130 over Lake Raymond Gary on October 3rd at 11:00 am, according to Commissioner Roger Vandever, Choctaw County District 3. The bridge was designed by Guy Engineering Services, Tulsa, OK. The original bridge was a 72 inch diameter corrugated metal pipe. The contractor, T. McDonald Construction, Inc. of Eufaula, OK, replaced the bridge with a double 10ft by 8ft reinforced concrete box. The new bridge will improve safety and accessibility for anyone traveling in Choctaw County. 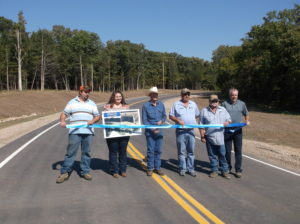 The bridge was constructed for $699,464, with funding provided by Oklahoma’s County Improvements for Roads and Bridges (CIRB) Program and with federal Surface Transportation Program funds.